The Dow is down -400 points. Brexit is turning closer to no-deal. US/China is still up in the air and gold is up, but it is not running up. The spot price is trading up about $3.60 at $1313. 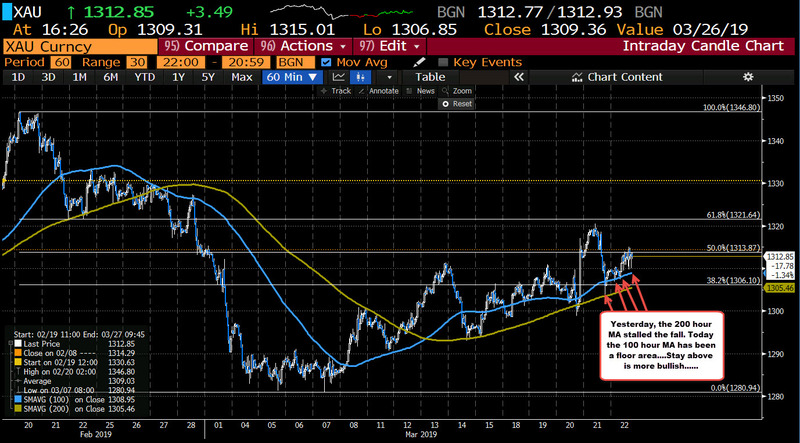 The high reached $1315.01. The low $1306. Technically, although not running, the buyers are still more bullish. Looking at the hourly chart above, the lows today did a good job of finding buyers against the 100 hour MA (blue line). That MA comes in at $1308.95. Below that the 200 hour MA comes in at $1305.46. This week, on Wednesday, the price did move below the 200 hour MA for a few hours, but that was short lived after the more dovish FOMC. Stay above those MAs, keeps the buyers in control. 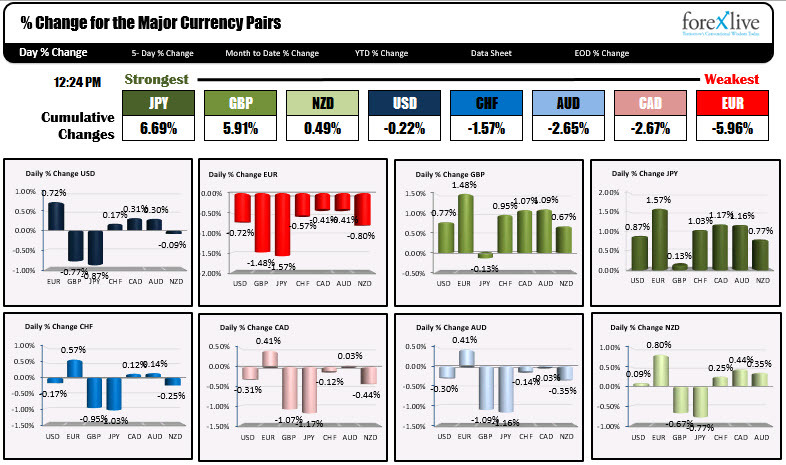 Today, the dollar is mixed with gains vs the EUR, CAD, AUD and CHF, but declines vs the JPY, GBP and NZD. That is helping to keep the flight to safety flows more balanced. If the dollar should start to come under more pressure (on yield curve inversion, tumbling stocks), but remember too, Euro yields are not running higher either. German 10 years are not trading at -0.026% while the US 10 year is still at 2.439%. That may make USD selling tough. Watch the 100 and 200 hour MA though. It will guide the market.